Time of Origin: Unknown, he comes from another Universe. 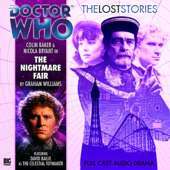 Appearances: "The Celestial Toymaker", "Divided Loyalties", "The Nightmare Fair" and "The Magic Mousetrap". Doctors: First Doctor, Fifth Doctor, Sixth Doctor and Seventh Doctor. Companions: Steven Taylor, Dodo, Adric, Nyssa, Tegan Jovanka, Peri, Ace and Hex. History: The Toymaker has a rather interesting history. He is completely alone in this Universe, cast out from his own by some unimaginable catastrophe. Since he is not from this Universe he obeys a different set of physical laws, giving him unbelievable powers and abilities, and since the two Universes are receding from each other, the laws of relativity dictate that his own life span is increasing. The Toymaker is already millions of years old, and he will live for millions more, and the isolation and loneliness have driven him mad; he long ago abandoned the empty thrills of creation and destruction, and now seeks distraction in the random hazards of gameplay. Upon arrival in this Universe, he joined the Council of Guardians, and became the Crystal Guardian of Dreams. This is another factor in his games - since The Black Guardian and The White Guardian create chaos and conflict to justify their existence, he creates games and illusions to justify his. He always sticks by his chosen rules, and often only tricks The Doctor by not mentioning some rules. The Doctor's first encounter with The Toymaker is actually rather interesting, since the Toymaker was The Doctor's first ever opponent, first meeting The Doctor while he was still at school. At this time, The Doctor was the member of a Time Lord elite known as the Deca, the best of their year at school. Its members were The Doctor, Koschei, (Later to become The Master) Ushas, (Later to become The Rani) Mortimus, (Later to become The Meddling Monk) Magnus, (Later to become the War Chief) Vansell, (Later to become a Coordinator for the CIA, as revealed in 'The Sirens of Time') Jelpax, and lovers Rallon and Millenia. The Toymaker incident started when The Doctor refused to return home to Lungbarrow for Otherstide and his Name Day because Kithriarch Quences seemed to expect his automatic, unthinking obedience. His tutor Delox, learning of his refusal, suspended him from the Academy until he had learned humility. It was on this day that The Doctor visited the hermit behind the Academy and learned the secret of life in a daisy. Armed with his new determination to prove to the Time Lords that things could change, he convinced his friend Mortimus to hack into the Time Lords' secret files and find something of interest that he could investigate. Mortimus found an entry on a legendary being, or beings, called the Toymakers, and The Doctor set off to investigate with his friends Rallon and Millennia, stealing a TARDIS with the help of their fellow student Magnus. Upon entering the realm of the Toymaker, however, Rallon was consumed and possessed by the spirit of the Toymaker, an ancient collective intelligence that took on Rallon's physical form and forced The Doctor to play its games while imprisoning Millenia. The Doctor won a game of Capture the Flag against a tin soldier by setting a trap on the muddy battlefield, and the Toymaker, impressed by The Doctor's skill, decided to release him in order to let him mature; he would prove a worthy opponent later in life. The Doctor was forced to return to Gallifrey in disgrace, having led Rallon to his death and Millennia to a worse fate, trapped forever as one of the Toymaker's living dolls. He was expelled from the Academy, and sentenced to 500 years of service in the records area and traffic control. However, if The Doctor managed to obtain his doctorate in his spare time, he could reapply to the Academy. The Doctor and the Toymaker eventually met again following The Doctor's saving the remains of the human race from enslavement ten million and seven hundred years in the future. The Toymaker made The Doctor invisible and forced him to play a game called Trilogic, in which The Doctor had to move different sized pieces from one corner to another on a triangular board, to rearrange them perfectly from the A corner to the C corner in only 1023 moves. If he made one mistake he would loose, and become a doll of the Toymaker. However, there was a catch - even if The Doctor won his game, he had to win his game after Steven Taylor and Dodo had won theirs, and if he finished his game first, they would become the Toymaker's dolls anyway. Also, The Doctor was incapable of warning his friends of the danger, because the Toymaker removed The Doctor's voice and made him invisible and intangible barring one hand. As if it wasn't hard enough already, whenever The Doctor began to slow down, the Toymaker moved him forward a certain number of moves, bringing him ever closer to his 1023rd move. The first game for Steven and Dodo was a game of blind man's buff against two clowns, in which one person had to wear a blindfold and be guided by their partner through an obstacle course. Steven and Dodo lost, but they discovered that the clowns cheated by using a transparent blindfold, so the game was played again, so Steven and Dodo won. The second game consisted of seven chairs, six of which would kill however sat in them. Dodo and Steven were forced to play against the King, Queen, Joker and Knave of Hearts, using a series of four dolls only. Despite Dodo briefly sitting in a chair designed to freeze her to death, both she and Steven survived while the Knave and Joker left the game, while the King and Queen were killed by a melting chair. Steven and Dodo then narrowly won a game of hunt the thimble, and managed to outmanoeuvre some dancing dolls to get to the next game. Their next game was against the Toymaker's ultimate player, the schoolboy Cyril, the most deadly of all as he was so innocent. The game was called TARDIS hopscotch, with numbered triangles at odd angles set into the floor. At the end is a raised platform on which stands a police box. Each player started at triangle 1, took a die and rolled it. The number thrown would appear on a pole-shaped dice indicator (So that nobody could cheat!). The player then moved the number thrown. The first one to reach number 14 - where stands the police box - is the winner. The only catch was that they could only jump - the area between the triangles was electric, and they'd be killed! Cyril tried to get rid of Steven and Dodo by coating triangle 12 with a slippery substance, but he accidentally walked on it himself and was killed. The Doctor, by then, had managed to join his companions, now having acquired the TARDIS, but he could only leave after he'd made his last move, which he could only make it standing right next to the game board, and once he'd made his move, the Toymaker's realm would collapse. However, The Doctor managed to win the game by disguising his voice as the Toymaker's, and instantly escaped just as the realm collapsed. After that, the Toymaker and The Doctor didn't meet again for four regenerations. When they finally did meet, The Doctor had received a telepathic call for help from Rallon during a dream, and then materialised on a space station orbiting the planet Dymok, a planet whose permanently comatose inhabitants apparently powered the Toymaker with their psychic abilities. The Doctor, Tegan Jovanka and Nyssa went down to the planet, and Tegan was met by a mysterious figure called the Observer and several Dymova, who hailed her as their Chosen One. Her forthrightness and strength of will were the key to saving the Dymova from the Toymaker, but at the same time the Toymaker was preparing his latest game for The Doctor, having made Nyssa and Adric doubt him. The Toymaker had brought The Doctor there because Rallon was dying and the Toymaker couldn't separate himself from Rallon, so he intended that The Doctor would replace Rallon if he lost. Adric and Nyssa had to play a chess game as the white King and Queen of the game, while The Doctor had to complete a double-sided jigsaw with his face on both sides at the exact same time as his friends finished their game. The Dymovans then attempted an attack on the Toymaker, focussed by Tegan's strength, but it apparently failed, the Toymaker diverting all the power back on Dymok, destroying it. The Toymaker appeared to have won, and summoned the crew of the space station and The Doctor companions to witness his defeat. But Adric, Nyssa and Tegan refused to let The Doctor sacrifice himself for them, and in that brief distraction, Rallon played his final card. Dymok never existed; it was an illusion created by Rallon to lay the groundwork for this plan, and the Observer was simply Rallon's Watcher, the wraith of his future selves. In that distraction created by The Doctor and his companions, Rallon forced himself through all twelve of his remaining regenerations at once, expelling the Toymaker from his body, thanks to Dymok's destruction channelling all the Dymova's power into Rallon. After a brief farewell to Millenia, really Nyssa pretending to comfort him, Rallon died at last. The Observer then merged with the Toymkaer, to keep him in check in future. As The Doctor left, he knew that this change meant a change for the Toymaker too- although he still looked the same and wanted the same things, he was a bit less mysterious now. Meanwhile, as he and his servant Stefan waited for the toyshop to repair itself, the Toymaker decided to visit a theme park in Blackpool. However, some time after arriving at the theme park, the Toymaker discovered that the Sixth Doctor and his companion Peri were there as well. The Toymaker tricked the two of them into going to the Space Mountain ride at the park, where he managed to capture The Doctor and then lure Peri to the closed Broken Neck Gap ride, eventually capturing her. The Toymaker than tried to attack The Doctor, stuck in a cell powered by the Toymaker's own mind, with a monstrous crustacean, but The Doctor convinced it that he was an intelligent life form. The Toymaker than locked The Doctor, Peri, and a man they'd met called Kevin, in a cell with a video game in it. The Doctor was meant to play the game, but instead dismantled it for its circuitry. Meanwhile, the Toymaker finished his latest, greatest game- the ultimate video game, depicting a lone player's battle against alien creatures in a blasted urban landscape. However, it had a catch- once the player lost all three of their game lives, a monster stepped out of the screen and killed them. The Tomyker, pleased, prepared to send out blueprints of the game, and then had The Doctor summoned to play the game himself. The Doctor had, at the time, managed to interconnect the cells and was working with the crustacean on a device to get them all out. However, then The Doctor was forced to play the Toymaker's new game, and while playing it, The Doctor worked out the truth behind the Toymaker. However, just as a game monster was about to kill The Doctor, the device the crustacean had finished was attached to Peri, causing her to disorientate the Toymaker with a psychic scream, knocking the Toymaker out and allowing The Doctor to escape the game monster. While the Toymaker was unconscious, The Doctor rewired the cells so they imprisoned only the Toymaker - since they were powered by the Toymaker's mind, the Toymaker would be trapped for the rest of his life. While The Doctor regretted having to do that, he knew he had no choice. Kevin met his brother again, captured by the Toymaker, and, on The Doctor's advice, the two of them started their own company thanks to the Toymaker's blueprints for a non-deadly version of the game. Despite the seemingly final nature of this defeat, The Doctor met the Toymaker again in his seventh incarnation, when the Toymaker had brought the inhabitants of the Hahlbrook Sanatorium into his realm to play a new series of games. Under unspecified circumstances, The Doctor was able to rally the Toymaker’s current players to compete against the Toymaker in various games all at once, resulting in the Toymaker being defeated and his power becoming fractured among the subconscious minds of the players, the Toymaker being reduced to a ventriloquist’s doll. Attempting to defeat the Toymaker for good, The Doctor transferred everyone back to the Sanatorium, arranging for his current companions Ace and Hex to monitor the rest of the players - himself included - making sure that they didn’t remember their confrontation with the Toymaker, knowing that the fragments of the Toymaker’s power in their minds would eventually ‘die’ due to the Toymaker being cut off from his realm. Although The Doctor’s plan nearly failed when his investigations into his lack of memory resulted in him discovering the doll-Toymaker - as well as the realisation that they were still in the Toymaker’s realm - prompting the Toymaker to challenge the inhabitants to individual games to regain his parts once again, he was eventually defeated when Doctor Ludovic ‘Ludo’ Comfort, his last opponent, who possessed an equal amount of the Toymaker’s power while confronting him in a game of chess, used his power to send the other players back to Earth, subsequently resolving to never make his next move in the chess game, thus leaving the Toymaker locked in a permanent stalemate and unable to regain his original powers. (How these events can be reconciled with the Toymaker’s fate in "The Nightmare Fair" is unclear; the most likely explanation is that, for the Toymaker, these events occurred before his encounters with the Fifth and Sixth Doctors, with his transformation into a doll and the subsequent restoration of his powers - having somehow manipulated Ludo to make his last move - damaging his original ‘link’ to Rallon, thus forcing him to seek out The Doctor once again and beginning the events of "Divided Loyalties").